Mary Soon Lee was born and raised in London, but became a naturalized US citizen in 2003. 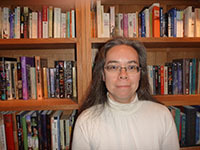 Her poetry has appeared recently in Dreams & Nightmares, Star*Line, and the Atlanta Review. She is married with two children and two cats. Her antiquated website is at www.marysoonlee.com.